April 29 is the feast day of St. Catherine of Siena. 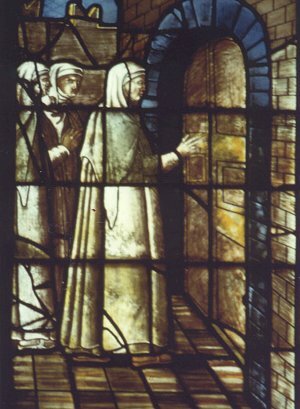 Sisters of St. Dominic of Amityville, New York by Laura M. Arvin, O.P. The Dominicans have her Letters online in English. Christian Classics Ethereal Library has her Dialogue as translated by Algar Thorold. When we contemplate our existence illuminated by faith, it becomes as enchanting as the best of fairy tales, don't you think? Let's reclaim the fascination with the sacred for our own culture. Remind folks that the popular herbal pick-me-up Hypericum is called 'St. Johns Wort' because it blooms end of June around about the time the Church commemorates the only other birthday of a saint besides the Blessed Mother - St John the Baptist. His spiritual 'pick-me-up' is what our ailing world certainly needs - metanoia!